Just sleep means that the notebook will go to sleep fast, but you lose the ability to change the battery as the battery is needed to keep the contents of the memory (RAM). SmartSleep lets you select each sleep state. 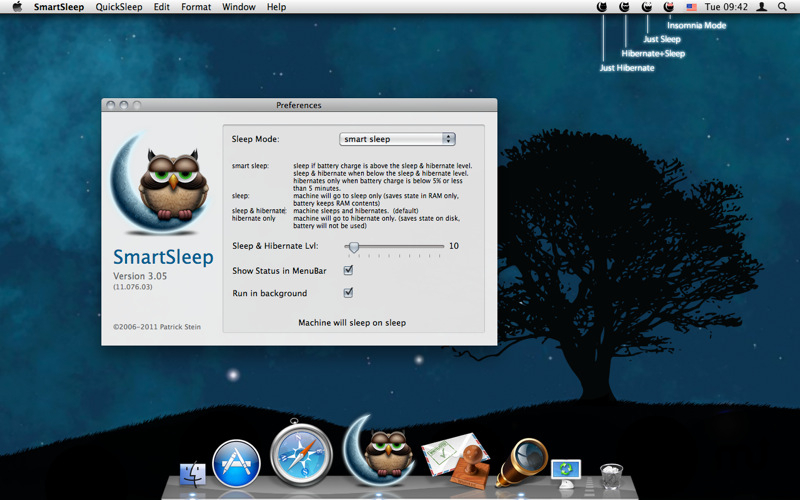 Additionally the new SmartSleep state lets your notebook just sleep while the battery has a high level. If the battery level drops below a certain point (default is less then 20% or 20 minutes) it will switch to sleep and hibernate. So you have the best of both worlds. Furthermore it will expand the lifetime of your SSD (if you have one) as your MacBook won't write a hibernate file as often. Adjust display brightness with high precision.